Like most suburbs that were built in the 1950s or 60s, Cupertino has a once-hopping mega mall that’s now a crumbling eyesore. But unlike most suburbs, Cupertino is now a very affluent hub of Silicon Valley capitalism. That’s a very, very common story in American suburbs, of course. But unlike typical dying malls, Vallco occupies some very, very valuable land. Just one major street over sits the construction site where Apple is building its new campus. A few miles north sits Mountain View. 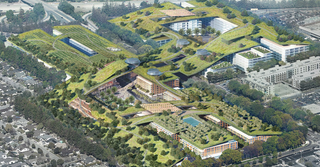 And so this week, Sand Hill announced its plans for the aging mall: “The Hills at Vallco,” a massive mixed-used development that will be covered by a 30-acre green roof, topped by “3.8 mile trail network for jogging and walking, vineyards, orchards and organic gardens, an amphitheater, children’s play areas and a refuge for native species of plants and birds.” That sounds lovely, though, building an artificial park featuring orchards during a historic drought will certainly be a challenge. Supporting all of these amenities will be a vast network of structures, including housing, retail, and office space arranged around streets. Infilling the blocks will be more public space, while walkways overhead connect the park spaces to one another. The whole development will be planned and designed by Rafael Viñoly (yes, the Rafael Viñoly behind the car-melting death-ray skyscraper in London) and OLIN Landscape Architects. There’s a good reason Sand Hill talks so much about the park and amenities and less about the development. As Silicon Valley Business Journal pointed out yesterday, this is a city that has been very cautious about approving big new developments in the past. Whether or not the Hills makes it through the fraught planning process intact, it’s pretty amazing to see the scale of new architecture and planning ideas being proposed in this region right now. From Google’s planned pseudo-utopian headquarters to Facebook’s own giant tree-covered box building, it’s an interesting time to be an architect and developer in Silicon Valley.